I’m two weeks into Project New Me and already I am experiencing a positive difference: increased energy levels, better quality sleep, improved mood etc. The addition of exercise this week has been a challenge, the internal wrangling that goes on in my head when the subject of exercise surfaces, would merit honourable mention on a who’s who list of the world’s most stubborn! Little Voice: Will she go and exercise now? Other Little Voice: No she can wait ’til later. Little Voice: But if she waits something will come up and she promised herself she’d do this. Little Voice: Yea but she has a stationary bike in the corner and a yoga mat over there so what’s your problem! Little Voice: Sure who’s going to see her…. Other Little Voice: She said she wanted to watch Operation Transformation and that will be on in 2 hours! Little Voice: But we only need to exercise for 15 minutes and what’s the point in watching someone else’s transformation, when there is a transformation to be made right here! The hardest part has been taking the bull by the horns, getting the gear on and getting out the door or pulling out the mat. Once that has been achieved my prescribed 15 minutes usually turns into anything from 30 minutes to an hour. 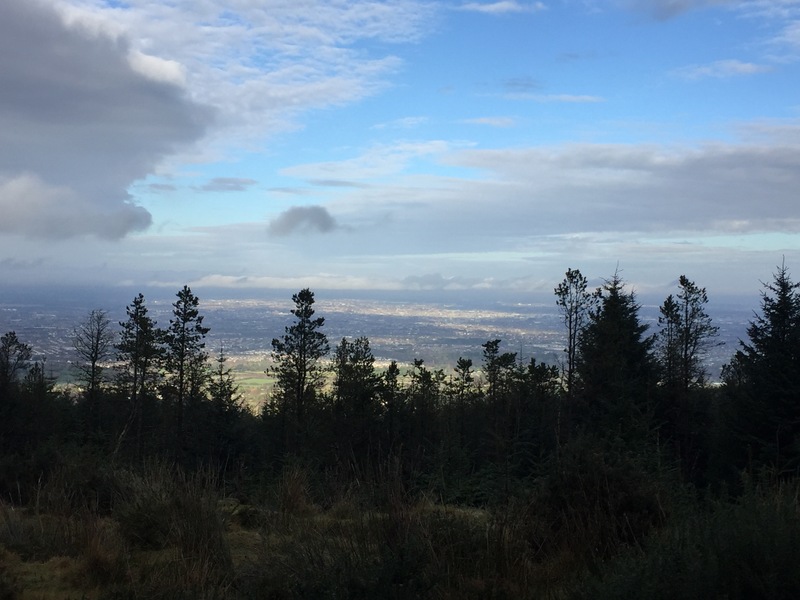 And I even managed a beautiful hike in the Dublin Mountains on Sunday, which would have been a shame to miss had I not shut the little voices up and gotten the boots on! I’ve also found that by getting the exercise done early in the day, lessens the chances of the wrong side of the internal debate winning out, but that is just me. My week one habit of eating fruits and/or veggies with every meal or snack is almost automatic now, in fact I have been eating a whole food, plant based diet almost exclusively for the past 10 days and I can honestly say it is delicious, varied and I don’t miss meat, eggs or dairy. And though still a struggle, I have stuck to my proposed exercise plan and I’m assuming that too will get easier over time too. Week 3: Hydration is key. I’m usual pretty good at drinking water, especially days where I am at my desk and not running around like some crazy person but I would like to be more consistent and so, drinking 2 litres of water per day will be this weeks addition to Project New Me. The plan is to add it on to of the good habits I a have been working on over the previous weeks. I hope you continue to enjoy these updates and do leave comments and suggestions below or on my Facebook link, it’s always great to hear from readers. Right back at you Joe. The little voices can have huge power if we let them! Holy buckets, you inspire me, Catherine. Keep it up…I will make my own plan to support you…and me! Thanks Rob. Thanks for reading and for supporting! Happy to reciprocate in any way I can. put coffee in the water.. sorted..
I’ve never been a coffee or tea drinker Denise but more recently I have, bit by bit, acquired a taste for an occasional mocha, the good news is many dark chocolates and drinking chocolate is non dairy, so a little treat now and then is allowed, with nut milk of course. Glad you are enjoying the blogs.